When most people think pizza, they think Italy, but Flammkuchen, the crispy and smoky German pizza, is definitely worth your time! October is national Pizza Month, and what goes better with pizza than a nice glace of wine? So, today the Sunday Supper crew is celebrating with Gallo Family Vineyards, sharing our favorite pizza recipes and wine pairings. While we do love a big slice of saucy, mozzarella-laden, classic, Italian pizza. It’s fun to explore the way that pizza has taken on a life of its own in regions outside of Italy. 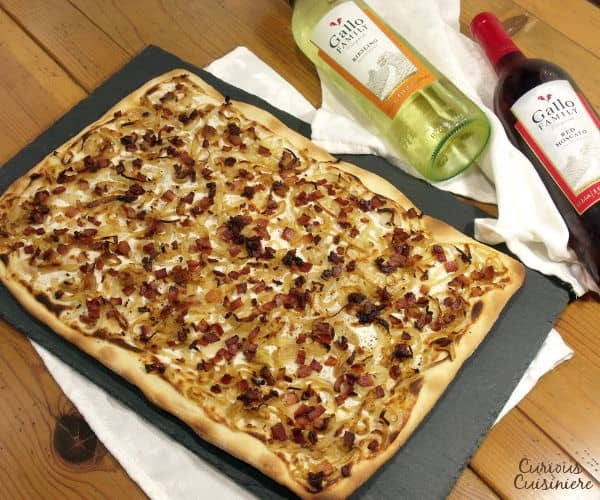 Like this specialty of Alsace: Flammkuchen. Flammkuchen (pronounced flam-KOOK-en) comes from South Germany and the Alsace region of France (along the southwestern French-German border). Translated ‘flame cake,’ flammkuchen were originally used by bakers to test the temperature of their ovens. A bit of dough was taken and rolled flat, topped with crème fraîche, and baked in the wood-fired bread oven for a few minutes. The amount of time it took for the flammkuchen to bake to nearly-blistered crispness told them the oven’s temperature. If the flammkuchen came out just right, then the ovens were ready to bake their bread. Thin and crispy crust pizza lovers, this pizza is for you! Flammkuchen is characterized by its incredibly thin, crisp, and blistered crust. We’re talking cracker-like here folks. Rather than a tomato sauce, the dough is spread with crème fraîche (KREHM fresh) a thick, French, soured cream. It is less sour than American sour cream, so if you can’t find crème fraîche, we recommend using plain, strained yogurt. (Yogurt is naturally thinner than crème fraîche, so we strain it through a fine mesh sieve or cheesecloth to thicken it to a more proper consistency.) When the crème bakes with the crust, it creates a slightly tart, creamy contrast to the crust’s crispness. 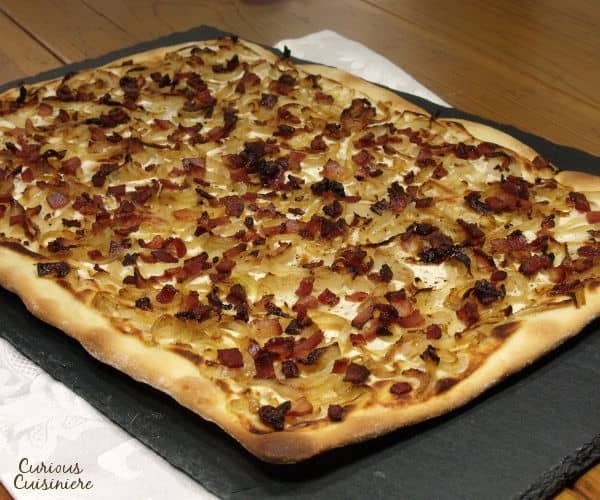 While you can use any toppings that you like for you flammkuchen, the most traditional combination includes bacon and caramelized onions with a bit of nutmeg and black pepper. 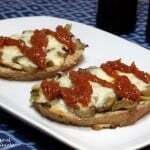 Other common variations include gruyère (or Swiss) cheese, mushrooms, or Munster cheese. You can even find sweet versions, typically made with apples, cinnamon, and a sweet liqueur. We went for the classic caramelized onion and bacon version. Because, really, how can you go wrong with those toppings? Crisp, creamy, smoky, with a hind of caramelized sweetness. 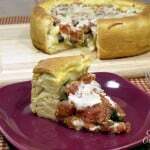 This pizza makes for a perfect light dinner or appetizer. And, of course, with our pizza we have to have some wine. 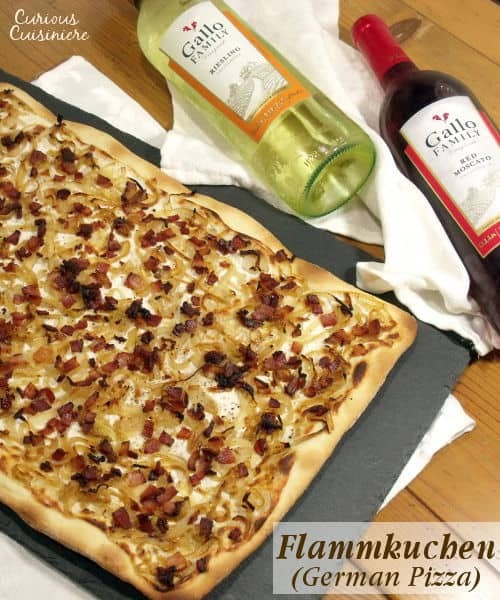 We paired our flammkuchen with Gallo Family Vineyards’ Riesling and Red Moscato. The Riesling is light and refreshingly sweet. It brought out the sweetness of the caramelized onions and acted as the perfect complement to the salty bacon. The Red Moscato is a slightly effervescent, medium-bodied red wine that is not overly sweet but still has a juicy, dark cherry flavor. 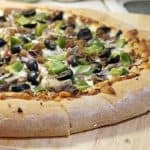 It accented the pizza in a completely different way, highlighting the smoky tones of the bacon and crisped crust and bringing out the black pepper garnish. Which wine will you choose? They both paired so well, I don’t think we could pick a favorite. You might just have to try it with both to decide for yourself! 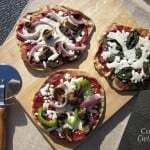 For more unique pizza recipes to pair with your favorite Gallo Family Vineyards wines, take a look at their National Pizza Month blog feature and the tasty dishes from the Sunday Supper family below. Be sure to find out where to pick up your favorite Gallo Family Vineyards wines for your next pizza party by heading over to their Store Locator. And, you can stay up to date on all the Gallo Family Vineyard wine news through their social media outlets: Facebook, Twitter, Instagram, and YouTube. In a large bowl, mix together flour, salt, water, and oil. Mix until a dough begins to form, the turn the dough out onto a lightly floured surface and knead until it is soft and smooth, 3-5 min. Set the dough aside and cover it with a towel. In a small bowl, mix together crème fraîche and nutmeg. Set aside. In a large sauté pan, sauté bacon over medium high heat, until it is cooked about halfway to crisp, 2-4 minutes. Remove the bacon (keeping the grease in the pan) to a paper towel lined plate. Set aside. Place the sliced onions into the hot bacon grease and sauté over medium heat, stirring occasionally, until caramelized, 10 min. Remove the pan from the heat. 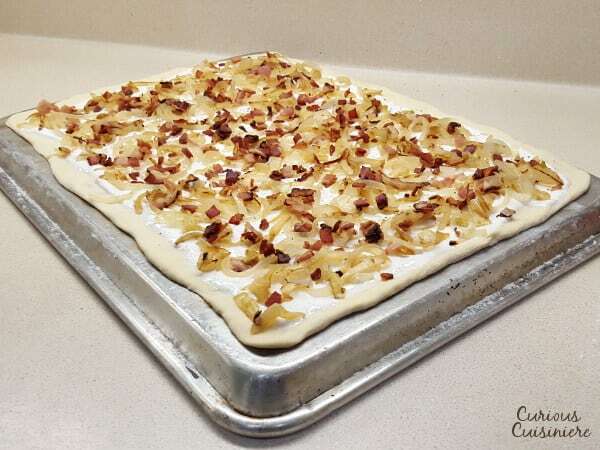 Roll and stretch the dough out into a rectangle, roughly 11x16 inches. Place the dough onto a large baking sheet that has been generously dusted with cornmeal. Spread the crème fraîche mixture over the crust, leaving just a little bare crust border. Distribute the caramelized onions over the crème fraîche, and sprinkle the bacon over the onions. Finish everything off with a dusting of black pepper. Place the baking sheet with the pizza into the oven and bake for 15-20 minutes, until the pizza is crisp and the edges are starting to darken. Remove from the oven, cut, and serve immediately with some good wine. *To strain your yogurt, place it in a couple layers of cheesecloth in a fine mesh sieve over a bowl for 20-30 minutes. 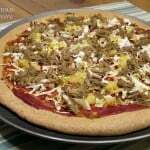 If you love unique pizza toppings, you’ll love what the Sunday Supper crew has in store for your today. You know you want to celebrate pizza with us! My husband and I recently spent time in Germany where we traveled a week in the Mosel River wine country.. We absolutely loved the Flammkuchen that were served in the little restaurants and vineyard tasting rooms. I was a bit surprised when they set my order down in front of me and it was the whole pie! I ate all but one piece. Sooo Goood!! Looking forward to trying your recipe. Such fun memories! We hope you enjoy it! At what point do you add the strained yogurt? Before onions and bacon? Hi Tricia. If using strained yogurt, you add it when the recipe calls for creme fraiche. So you will mix it with nutmeg and use it a the “sauce” for the pizza — on top of the crust but before the onions and bacon. Enjoy! 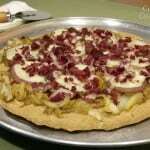 Back in the early 1960’s my first experience with pizza was in Brainerd Minnesota. The one local pizza place cooked a crispy thin crust pizza which was closer to what I later experienced in Italy than any other pizza I have had in America. And now I realize that it was really Flammenkuchen, or the Swedish, Norwegian, Finnish equivalent. I look forward eagerly to trying this out to relive a memory. What a wonderful memory John! We hope you enjoy this Flammkuchen recipe! I had this in Alsace years ago and will try yours soon. I’m know how good it is and can hardly wait!! Recently, I had a variation in The Hague with the crust baked alome, some warm smoked salmon, green leaves, capers and thin cuts of red onion. Wasabi mayonnaise on top. It was great!! Oh my goodness!! That sounds wonderful! We are going to have to try those toppings the next time we make Flammkuchen! OMG – soo good. i’ve been lucky enough to eat them in their country of origin, and when I saw some Dr. oetker frozen flammkuchen, i coulfn’t resist – they were nearly as good as the original. they’ve since stopped producing them, or no longer in canada (?) so i have to DIY it if i want some . I haven’t tried the recipe yet, butr will very soon. They really are so good! We hope you enjoy them! Hi Carolyn. That flavor combo sounds amazing. We’ll start experimenting with it and see if we can’t come up with something. In the meantime, we hope you and your granddaughter enjoy this version! I cannot believe I have never heard of this pizza before. It sounds absolutely amazing. I have been missing out. We hadn’t heard of it until a friend of ours introduced is to it while we were in Germany. It needs to take the States by storm!! Your pizza looks delicious and sounds so flavorful! I cannot wait to try it! Very unique take on pizza. I never knew of this version. Thank you for teaching me something new. Thanks DB! It’s a fun one, that’s for sure! Love the history and I am so making a pizza with creme fraiche. Sounds amazing! Thanks Brianne! The creme fraiche makes for such a fun ‘sauce’! 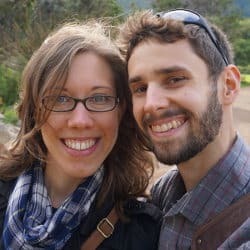 I love learning something new and your post is filled with great new info. I, also, LOVE a cracker like crust so this pizza is perfect for me! Thanks Betsy! Our motto is never stop learning! It’s great to hear that others appreciate hearing about our discoveries! Sarah, I love how you always share the info behind the food. 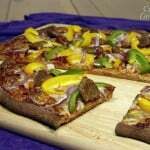 It’s so interesting, and your description of this pizza has me craving these wonderful flavors! Thanks for sharing! Thanks Marian! 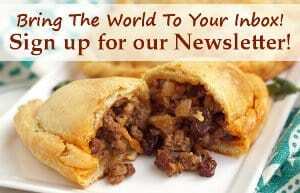 We love learning about the food we cook and culture behind it. It is wonderful to hear that you love background we share! I love thin crust pizzas at home (delivery style thin crust is so not good to me, however)! This sounds like a pizza I could get behind! The great thing about thin crust at home is you can eat it right out of the oven, when it’s still SUPER crispy! The thin pizza is more like phyllo to us in U.S.
Hi Karen. The flammkuchen we tasted in Germany were closer to a very thin and crispy crust pizza. But, it is quite possible that some versions from other regions around Germany might take on a closer likeness to a phyllo crust. Thanks for your comment! That’s wonderful Liz! This is definitely a crave-worthy pizza!